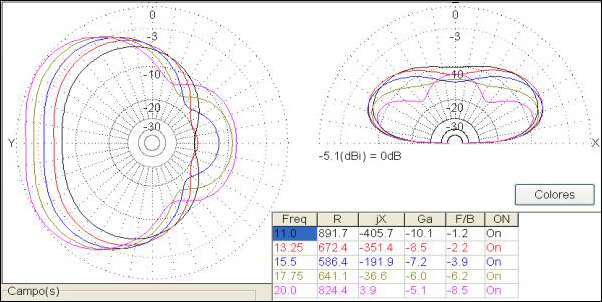 This article describes the design and simulation of a multiband Sloping Vee antenna for the HF band, using the software MMANA-GAL. 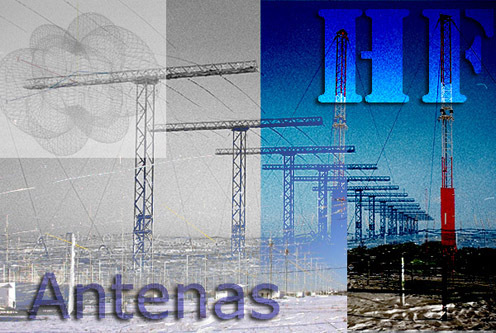 The simulations are focused to obtain the impedance and the radiation patterns of the antenna between 2 MHz and 20 MHz. Remarks: Design with 470 ohms resistive loads. The antenna requires a 4:1 balun. In this sloping vee design, each leg has a length of 12 meters and a resistive grounded load of 470 ohms (fig.1). The heigth of the mast must be of at least 6 meters. 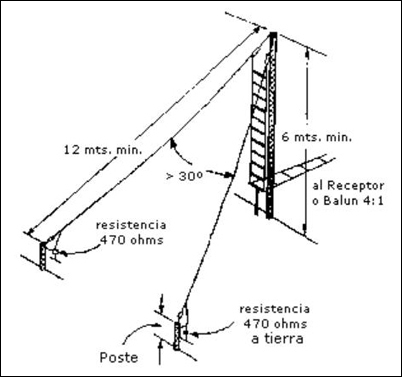 The transmission line should be of a ladder type, with adequate impedance, and requires a 4:1 balun. It is recommended to use an antenna coupler, especially for ALE operation. Fig.1. Sloping Vee antenna with 470 ohms resistive loads. The fig.2 shows the antenna modeled with MMANA-GAL. Fig.2. 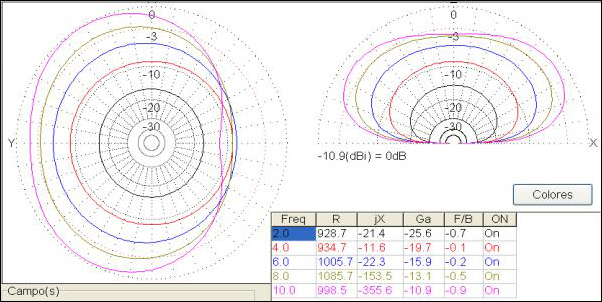 Sloping Vee antenna with 470 ohms resistive loads modeled in MMANA-GAL. The feeding point is located in the "Z" axis, at a height of 6 meters. 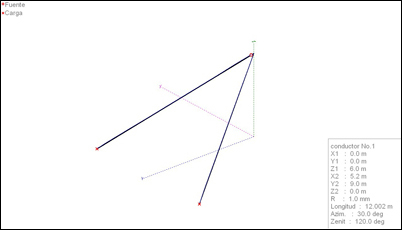 This is the departure point for the legs of the dipole, forming a 30 degrees angle whose bisecting line is the "Y" axis. The 470 ohms resistive loads are located in the opposite side of each leg. 2.1. Standing wave ratio (SWR). The fig.3 shows the calculated SWR for a characteristic impedance of 200 ohms, corresponding to a transmitter with 50 ohms of output impedance and a 4:1 balun. Fig.3. SWR for a characteristic impedance of 200 ohms. Although the SWR level is low, we can see that it is necessary to use an antenna tuner. The fig.4 shows the radiation patterns calculated at frequencies between 2 MHz and 10 MHz. Fig.4. Radiation patterns at 2, 4, 6, 8 and 10 MHz. The fig.5 shows the radiation patterns calculated at frequencies between 10 MHz and 20 MHz. Fig.5. Radiation patterns at 11, 13.25, 15.5, 17.75 and 20 MHz. This is a directive antenna but with low front-to-back ratio. The radiation maximum is achieved at the bisector of the angle defined by the two arms, with losses in the whole band which are more pronounced at lower frequencies. Although this is a quite inefficient antenna, it has the advantage of a low SWR in all the HF band. Not recommended for NVIS operation due to its low gain at low frequencies.